Every place is known for special dishes cooked and loved by people. Hyderabad is famous for its spicy, aromatic, flavourful and tastiest biryani dishes (Rice cooked with meat /vegetables and spices). Hyderabadi biryani is just heaven for foodies.I like everything about the biryani served in Hyderabad’ food joints. Biryani is served mostly with Mirchi ka salan and it tastes equally awesome. 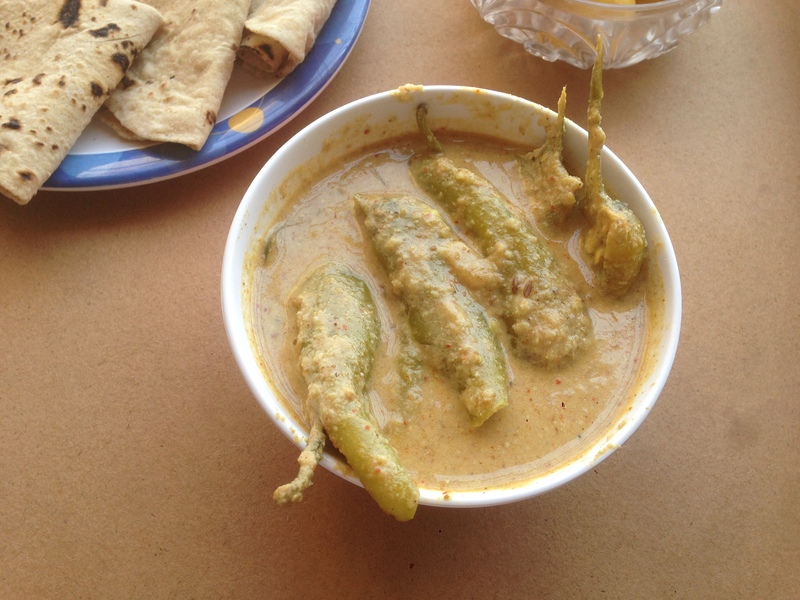 I decided to learn this spicy curry Mirchi ka salan which makes prefect combo with Biryani. When I tried it for the first time, it was absolutely disaster, but taste improved with number of trial and errors. This curry/ salan is made using fresh green chillies( it’s different type of chili which is big in size and less spicy/hot in taste than normal green chili). It’s made using selected spices and simmered in coconut, sesame and peanuts gravy. 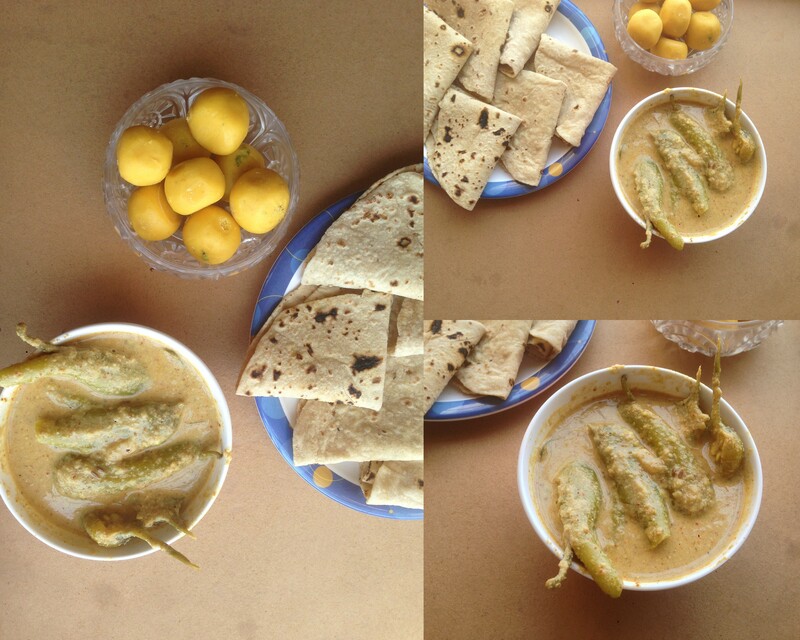 As name of the dish is “mirchi ka salan” sounds very hot and spicy curry, but actually it is not so. The ingredients like coconut, sesame and peanuts balance the spicy taste with nutty and sweet taste. And curry tastes excellent when cooked properly. Generally it is served with biryani but I like it with plain roti and rice also. Green chilies simmered in coconut ,sesame ,peanuts and spicy gravy. Wash and deep fry green chilies in oil and keep it aside. Roast peanuts , sesame seeds and grated dry coconut separately. Grind roasted coconut,sesame,peanuts ,with some water to get fine paste. Make ginger and garlic paste separately. Heat pan and pour oil in it. Add cumin seeds , mustard and asafoetida in oil after it gets enough hot to crackle seeds. Add ginger and garlic paste in oil and saute for a minute. Add curry leaves in it and saute for a minute. Add ground nuts paste paste and saute for 2 minutes. Add Tamrind pulp in pan and saute it. Add cumin powder,turmeric,salt,coriander powder ,garam masala ,chili powder in pan and mix all ingredients well. Mix well all together and cook this mixture on low flame for 5 to 6 minutes . Add fried green chilies in cooked mixture and mix well. Add water as per required consistency.More water is required as this gravy thickens after cooking. Add salt and sprinkle chopped coriander leaves. 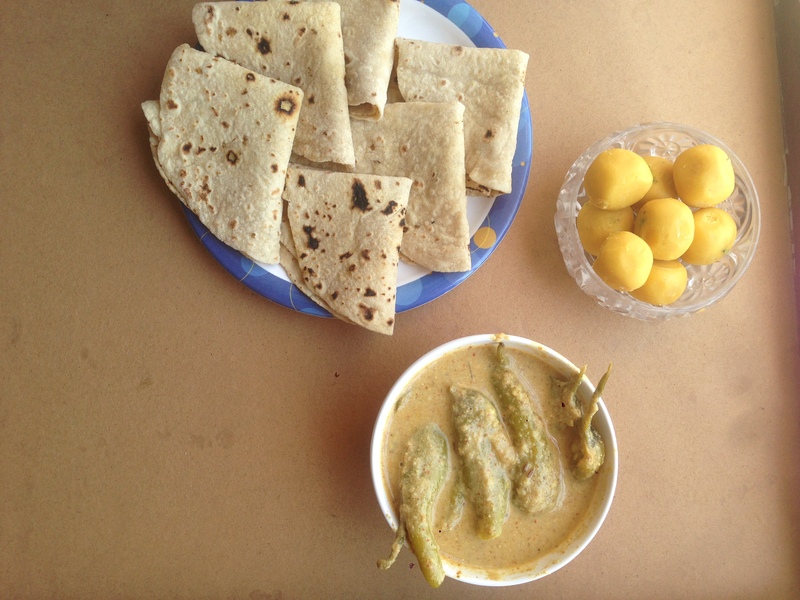 Cook mirchi ka salan on low flame for 10-12 minutes. Serve hot mirchi ka salan with biryani or rice. Why buying kids dresses online would make your life easier?